On March 31, 2016, President Obama, President Park, and Prime Minister Abe held a summit in Washington, DC on the sidelines of a nuclear security summit. They agreed to be united in responding to provocative actions by North Korea and to enter into discussions for upgrading security cooperation, as well as to work toward steady implementation of the United Nations Security Council (UNSC) resolution to impose sanctions on North Korea. At a press conference, Abe said, “The leaders of the three countries confirmed it is necessary to further promote US-Japan-South Korean cooperation in the area of security. The meeting was timely and extremely meaningful.”1 This meeting symbolizes a new stage in trilateral cooperation, which had long been limited because of bilateral conflict between South Korea and Japan centered on the “comfort women” issue. At a bilateral meeting between Park and Abe on the same day, they confirmed the importance of steadily implementing their accord on December 28, 2015. The general mood of the trilateral summit drastically contrasted with the previous trilateral meeting in March 2014, held at the initiative of Obama on the sidelines of the nuclear summit in the Hague, when Abe greeted Park in Korean, but she did not respond amicably, and they could not reach any meaningful conclusions on their conflicts. This time, they exchanged words in a friendly manner, shaking hands with each other with smiling faces. The rapid progress in trilateral security cooperation may be a surprisingly pleasant development for the United States and Japan, considering the conveniently circulated image that South Korea has been tilting toward China since Park assumed power in 2013.4 During the three-year period, Park and Chinese leader Xi Jinping held six summits while she met Abe, one-on-one, only in early November 2015, two and half years after she assumed power. To the dismay of Washington, the two close US allies did not even hesitate to engage in confrontational diplomatic encounters inside the United States. For a couple of years Washington turned out to be a history battlefield between South Korea and Japan. Diverging perspectives about history underlie conflicts between South Korea and Japan. In particular, provocative remarks by Abe and his cabinet members molded negative images about Japan among Koreans. Vice Premier Aso, when he attended Park’s inauguration ceremony in February 2013, asserted that South Korea and Japan could hardly share history consciousness. This made Park and her close aides furious. Aso and three other cabinet members visited the Yasukuni Shrine in April, 2013. On December 26, 2013, Abe himself paid a visit to the shrine despite American advice not to do so.5 Abe also made repeated strong arguments that “comfort women” were not forcefully mobilized—a perception at sharp odds with the Korean general public’s understanding about these women and a betrayal of the spirit of the Kono statement, which declared in 1993 that “comfort women” were mobilized against their will. As the first female president in South Korea, who showed sympathy for comfort women, Park could hardly accept Abe’s stance. Her government’s strong stance against the Abe cabinet also resonated negatively in Japan. Anti-Korean publications were printed in bulk. Anti-Korean demonstrations increased dramatically. Even “hate speech” against Korean residents in Japan grew rampant. These negative images led to a downward spiral, escalating the emotional conflicts and diplomatic confrontations between the two countries. It seemed as if Japan was pushing South Korea from its diplomatic parameters. While the Abe cabinet tried its utmost to strengthen cooperative ties with the United States, it remained cool, or even negative, toward South Korea and Japan-South Korea relations. Ironically, it is around this time that the Park administration began taking a more flexible stance toward Japan. However, the Abe cabinet’s attempt to legalize the right of collective defense in the latter half of 2014 ignited another round of negative appraisals about Japan in South Korea. Though the United States heartily endorsed this move, South Korean media interpreted Abe’s initiative as an effort to get rid of the cork in the bottle, which would allow Japan to actively participate in a war. Negative assessments of Abe’s move added fuel to criticize Japan. Abe’s security revisionism combined with his history revisionism revived the ghost-like image of imperial Japan in the mindset of the South Korean general public, completely contrary to US thinking, which supported Abe’s strenuous endeavors to allow the right of collective self-defense. The United States also favored the idea of Japan playing a more active role in international security. This divergence between the US and South Korean governments about Abe’s security-related initiative put an enormous diplomatic burden on South Korean officials. As a US ally, South Korea could not stand against the US support for Japanese initiatives. At the same time, South Korean leaders could not ignore the general public’s critical stance against Japan. A turning point in the bilateral relationship between South Korea and Japan occurred when Park attended a reception held by the Japanese embassy in Seoul, while Abe attended a reception organized by the Korean embassy in Tokyo on June 22, 2015—the fiftieth anniversary of signing the normalization treaty in 1965. The two leaders exchanged favorable messages toward each other, expecting a better relationship in the future. This move was recognized as a signal of their willingness to improve the relationship. However, this did not necessarily mean that South Korea was moving away from China and toward Japan. On June 29, 2014, South Korea made a decision to join the Asia Infrastructure Investment Bank (AIIB) initiated by China. South Korea was not the only US ally to join the AIIB. France, Germany, Italy, Australia, New Zealand, and other countries also joined the AIIB. However, the South Korean entry was again interpreted as a move favoring China at the expense of the United States and Japan, both of which remained critical of the AIIB. Another action that strengthened the image that South Korea is tilting toward China was Park’s attendance at the military parade on Chinese Victory Day on September 3, 2015, where she stood together with Xi and Russian leader Putin. The foreign mass media featured this as evidence of South Korea bandwagoning with China. However, two strategic intentions underlay Park’s visit to China. One was related to North Korea. Before Park visited Beijing, Pyongyang made an unexpected military assault against South Korea around the demilitarized zone (DMZ), escalating tensions between the two Koreas to an extreme degree. Though the confrontation was carefully managed by high-level talks between the two Koreas, it renewed attention to the volatile security situation on the Korean Peninsula. The young North Korean leader, Kim Jung-un, was perceived as unpredictable and provocative. In order to manage the North Korean problem, the Park administration needed to pull China more to the South Korean side. In exchange for visiting Beijing in the face of negative evaluations in and outside South Korea, Park wanted to point to a new consensus with China on North Korea. The summit between Park and Xi mentioned the possibility of cooperation in the process of Korean unification.8 This was a remarkable statement: a Chinese leader discussed the issue of Korean unification together with a South Korean leader for the first time. The other strategic intention related to Park’s Beijing visit was associated with Japan. Park wanted to hold a summit meeting with Abe; however, a bilateral meeting either in Seoul or Tokyo was politically risky for both Park and Abe, considering negative public opinion in both countries. The best possible scenario was to convene a trilateral meeting among South Korea, Japan, and China and then hold a bilateral summit between Park and Abe on the edge of that. That is why Park insisted on the importance of reconvening the trilateral summit, which has not convened since April 2012, in Seoul. During Park’s Beijing visit, Xi consented to the idea of holding this trilateral summit in the fall of 2015. In this way, Park opened a window of opportunity to upgrade ties with both China and Japan. The Northeast Asian Trilateral Summit was held in Seoul on October 31, 2015 and confirmed the importance of revitalizing the summit. The next day, Park and Abe held the first bilateral summit since they both assumed power, discussing issues of common concern in a comprehensive manner, but a focal point was how to resolve the “comfort women” issue at the center of bilateral conflict. They agreed to expedite the negotiations with a view to concluding them soon, if possible within the year 2015. As 2015 was the fiftieth anniversary of normalization, Park wanted to resolve this long-pending issue by the end of this meaningful year. Another consideration was that only 46 of the victimized women were surviving at the time. Their average age was 89. Within a single year, 2015, nine died. If negotiations were further delayed, only a limited number of survivors would get benefits. To the surprise of his South Korean counterpart, Abe firmly committed to resolving the “comfort women” issue in 2015. Before Christmas, Abe declared that he would send Foreign Minister Kishida to Seoul to cut a final deal.9 On December 28, 2015, both governments agreed on a formula for solving the “comfort women” issue. Abe accepted what the South Korean government had repeatedly requested. First, he acknowledged the involvement of the Japanese military in the mobilization of “comfort women,” though he denied the element of enforcement in the process. Second, the accord made it clear that the Japanese government is painfully responsible for the damages they have awarded on “comfort women.” Third, Abe, as prime minister representing Japan, apologized and showed repentance. Fourth, the Japanese government agreed to use only a government budget of one billion yen for establishing a foundation to take care of “comfort women.” In response, Park promised to fulfill what Abe wanted in the process of implementing the accord. One, the Korean government announced that this deal is “final” and “irreversible.” Second, both governments promised that they would abstain from blaming and criticizing the other party in international society. Third, the Korean government made it clear that it would make the utmost effort to relocate the statue in front of the Japanese embassy in Seoul on the basis of close consultations with relevant bodies. A careful analysis of the accord suggests that the Korean side pushed for the Japanese government to accept formal responsibility while the Japanese side wanted the statue to be removed. There was a reciprocal exchange. This accord between Park and Abe opened a new chapter in Korea-Japan relations. Though the accord received half-hearted evaluations from the public in both countries, the “comfort women” issue did not stand in the way any more.10 Through this accord, the United States could find a way to encourage new linkages between South Korea and Japan. Drawing a full circle of security cooperation in East Asia by removing elements of conflict between the allies has been a long-cherished US dream, increasingly so in the context of a rising China and a provocative North Korea. New momentum for upgrading US-ROK-Japan security cooperation arrived unexpectedly when North Korea conducted its fourth nuclear test, three years after its third test, Considering the six-year gap between the second and third nuclear tests, it was clear that North Korea was speeding up the process of upgrading its nuclear weapons capability. Furthermore, it argued that the fourth one was a hydro nuclear bomb test, which alarmed not only South Korea, but Japan and the United States too. China was alarmed that North Korea refused to give any prior notice to it. South Korea, together with the United States and Japan, claimed that North Korea’s bad behavior should be penalized, immediately agreeing that heavier sanctions should be imposed on recklessly rule-breaking North Korea and on preparations for a stronger UN resolution against North Korea, because its nuclear arsenal could be a present and serious security threat to all of them. The nuclear test provided a new platform for upgrading security cooperation among the three countries. South Korea embraced this idea without any hesitation or reluctance, giving new impetus to its relationship with Japan. The Chinese government, however, had a different take on the North Korean nuclear test. It suggested that heavier sanctions against North Korea would only lead to hardship for ordinary citizens. China also argued that pushing North Korea into an isolated corner might make it unpredictably dangerous. In addition, China suggested that concerned parties should rely on dialogue rather than sanctions to improve the situation. At first, China did not show sympathy with the idea that heavier penalties should be applied. As an extension, Chinese authorities repeatedly called attention to the importance of convening the Six-Party Talks as a mechanism to dissuade North Korea from developing nuclear weapons and, eventually, to denuclearize the country. In the eyes of South Koreans, all of these messages sounded as if China was taking sides with North Korea to secure it as a buffer against the US-Japan-ROK alliance. Few Korean strategists believed that Six-Party Talks would be an effective mechanism to induce North Korean denuclearization. Kim Jung-un repeatedly argued that he had no intention to give up nuclear weapons. Also, he claimed that North Korea had no intention to go back to the Six-Party Talks as long as they are for denuclearizing North Korea. Rather they opted for nuclear arms control and reduction talks, having inserted in 2012 a constitutional clause that North Korea is a nuclear weapon state. It was clear that North Korea had little incentive to return to the table after the nuclear test. Therefore, Chinese claims that dialogue should be advanced first and that Six-Party Talks would be a proper venue to talk about denuclearizing North Korea sounded as if China was unwilling to join the United States, Japan, and South Korea in imposing heavy penalties on North Korea. North Korea announced its intention to launch a long-range missile on the day the Chinese representative to the Six-Party Talks, Wu Dawei, visited Pyongyang. This amounted to a slap in the face of China, when it was trying to be a mediator between North Korea and other regional powers. 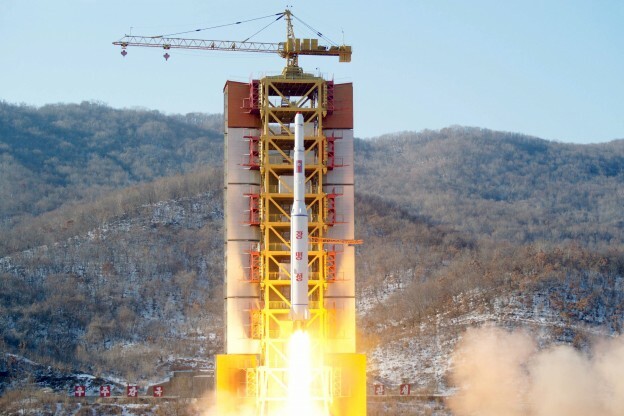 North Korea actually launched a long-range missile on February 7, 2016, despite Chinese warnings. After the North Korean missile launch, China began shifting its negative stance toward consenting to a new Security Council resolution. Four factors contributed to changing the Chinese attitude toward North Korea. First, South Korean public opinion turned negative about China remaining passive on the North Korean issue.Newspaper editorials and columns began criticizing the Park administration for failing to induce Chinese cooperation.11 Criticisms mounted because the Park government had claimed until that time that South Korea-China relations are at an all-time peak under the Park regime. However, the fact that Xi Jinping did not even pick up the phone when Park tried to reach him was publicized as telling proof that China was not seriously considering South Korea’s legitimate concerns. A turbulent period in bilateral ties between South Korea and China was rapidly taking shape. Second, Park expressed this diplomatic backlash in January 2016, implying that South Korea would enter into substantial negotiations with the United States about introducing the Terminal High Altitude Area Defense (THAAD) system on Korean soil. As the THAAD issue is something China always raises in warnings to South Korea, bilateral ties rapidly turned sour. China did not want to leave this stalemate as it was. Second, Chinese public opinion also eventually turned more negative toward North Korea, viewing it as unpredictable, disrespectful of Chinese requests, stubborn in sticking to its own principles, and, thus, becoming a burden rather than an asset to China. Third, within South Korea, some news media and politicians began arguing that South Korea should seriously consider going nuclear.12 They claimed that North Korea would never give up its nuclear arsenal and that relying only on the US nuclear umbrella would not be an effective defensive mechanism to protect South Korean citizens. Independently developing nuclear weapons might be a realistic way to respond to the North Korean nuclear threat, they argued. This sent a warning signal to neighboring countries, including China. Finally, to the surprise of many, Park made a bold decision to close the Kaesung industrial complex, which. was seen as the last vestige of communications and cooperation with North Korea. At the same time, the complex was also regarded as a dollar cash cow for the North Korean leader. Cutting out this long-cherished cooperative project between the two Koreas sent a clear message to neighboring countries that South Korea was truly serious about imposing sanctions on North Korea. Before that, China and Russia occasionally had claimed that by running the Kaesung industrial complex South Korea was giving them leeway to conduct economic activities too. After Park made up her mind to stop the project, China and Russia lost any rationale to delay their consent to a Security Council resolution. On March 2, 2016, Resolution 2270 passed with their consent. At the end of March, 2016, the nuclear security summit in Washington DC gave Obama and Park an opportunity to affirm their common posture toward provocative North Korea and further strengthen the US-ROK alliance. Also, on March 31, Obama, Abe, and Park confirmed their determination to implement the UNSC resolution in a concerted way and enhance the level of three-way security cooperation. In order to realize this, South Korea and Japan agreed that vice-minister level talks would soon be launched to discuss concrete policy measures. Park and Abe met separately and confirmed that the December 28 consensus on “comfort women” should be steadily and sincerely implemented and cooperation in all areas should be promoted further. Furthermore, Xi Jinping and Park held a meeting and reconfirmed that UNSC resolution 2270 would be implemented in a steady and comprehensive manner. It is fair to say that the high-level political deal on the “comfort women” issue, which had strangled the ties between Seoul and Tokyo, opened a new window of opportunity to improve bilateral relations. The deal also provided momentum to link the United States and its two allies in East Asia in an unprecedented way. The North Korean nuclear test and long-range missile launch at the beginning of 2016 established a firm platform on which the United States, Japan, and South Korea could go further in becoming united and upgrading security cooperation. Looking at the sudden surge of security cooperation among the three, China began taking a fresh look at the North Korean issue. If China continues to handle North Korea in its traditional manner, considering the North to be a strategic asset or buffer state, China cannot avoid a situation of facilitating heightened security cooperation among the United States, Japan, and South Korea, while assuming the burden of indulging North Korea on its own. It understood that North Korea would end up as a strategic burden and liability rather than a useful asset and leverage against other regional powers. That is why China took a more realistic stance, consenting to the UNSC resolution together with the others. By upgrading security cooperation with the United States and Japan while inducing Chinese cooperation on the North Korean issue, South Korea could get over a twisted image of tilting toward China. Its diplomacy returned to normal from at least the appearance of working too favorably with China. However, this does not mean that South Korean diplomacy has regained a stable equilibrium. At least a few challenges lie ahead in coming months and years. First of all, implementing the “comfort women” deal is likely to be a daunting challenge for both South Korea and Japan. Though both sides agreed that this issue should no longer be a barrier to deepening cooperation, patience and tolerance are needed to implement the deal. Japanese right-wingers claim that removal of the statue in front of the Japanese embassy should be linked to the payment of one billion yen to the foundation, which will be established in South Korea. Hagiuda Koichi, deputy chief cabinet secretary of Japan, said on April 7: “It is hard to imagine that the statue in front of the Japanese embassy in Seoul remains on a day celebrating the establishment of the foundation for comfort women.”13 He suggested that there is a close linkage between the establishment of the foundation and the removal of the statue. However, the statue has been established by the private sector and the Korea government has limited authority to remove it. At least, it is politically hyper-sensitive in that 66.3 percent of the South Korean public are against the removal or relocation of the statue.14 That is why Park promised simply to make the utmost effort to relocate it after consultations with relevant bodies. The nature of the promise was not to get rid of it but to try to do it. However, Japanese understanding of the accord is different from that of their Korean counterparts. This cognition gap may create unnecessary trouble in the process of implementing the accord. It may lead to a revival of the downward spiral unless political leaders on both sides act prudently. Careful management of the implementation process is necessary to sustain the hard-won cooperative atmosphere between South Korea and Japan. Second, after North Korea’s repeated military provocations, the South Korean government is positively considering the possibility of THAAD deployment on the basis of close consultations with the United States. In January 2016, Washington and Seoul reached a tentative agreement that the purchase and operating charges for THAAD would be assumed by the United States, while South Korea would be willing to assume the cost of military facilities in accord with the US-ROK mutual security treaty. However, such controversial issues as the effectiveness of THAAD for defending South Korea from North Korean missiles, the overwhelming cost of introducing additional THAAD units to South Korea, and domestic political sensitivities have not been complexly addressed. Furthermore, China is extremely sensitive to the deployment of THAAD, arguing that THADD would greatly damage its security interests.15 It seems as if China is overly and prematurely reacting to the THAAD issue at this stage, because the final decision has not been reached, even between the US and South Korean governments. Calming Chinese voices of apprehension remains a diplomatic challenge for South Korea and the United States. Third, in order to advance US-Japan-South Korean security cooperation, taking a joint and concerted posture toward North Korea is indispensable; however, to deepen security cooperation further, expanding the security parameters to a wider regional theater may be necessary, including the South China Sea. Considering the existence of an immediate and present danger from North Korea, the South Korean commitment to the South China Sea area may remain principally rhetorical and symbolic, even if there is no doubt about its support for the basic principles of freedom of navigation and observance of international laws in this area, as well demilitarization of the artificially formed islands. Concrete actions on the part of the South Korean military, accordingly, may be conducted only in a limited fashion. Finally, mobilizing a concerted long-term approach toward North Korea among the relevant parties in the region poses a daunting challenge for South Korea. All the countries involved in the Six-Party Talks are in basic agreement about the value of avoiding war on the Korean Peninsula, denuclearizing North Korea, and solving the problems through dialogue and negotiations. However, they have diverging evaluations of the strategic value of North Korea for their own and regional security, of the priority of issues to be addressed, of the sequence of actions to be taken, and of a long-term vision for the stability of the Korean Peninsula. As long as North Korea continues to provoke South Korea and neighboring countries, the relevant parties may be able to maintain their cooperative stance. When North Korea initiates a peace offensive, however, diverging opinions may erupt sporadically. Therefore, South Korea should make diligent endeavors to provide a road map for long-term peace and stability on the Korean Peninsula, including a vision for a unified Korea. 1. The Japan Times, April 2, 2016, 1. 2. See Bruce Klingner’s commentary in Yomiuri Shimbun, April 2, 2016. 3. A personal conversation with a high-ranking government official on January 26, 2016. 4. A representative article is Takesada Hideshi, “Naze Kankoku wa Chukoku e sekkin surunoka,” Gaiko, January 2014, 38-43. 5. Yonhap News made it clear that Vice President Biden personally admonished Abe on December 12, 2013 not to visit the Yasukuni Shrine. Yonhap News, January 29, 2014. 6. Examples are in Donga Ilbo, July 6, 2014 and Hankyoreh, July 11, 2014. 7. Yonhap News, March 20, 2015 and June 1, 2015. 8. Yonhap News, September 6, 2015. 9. KBS News, December 24, 2015. 10. According to a survey conducted by Joongang Ilbo, 53.7 percent of the respondents negatively assessed the accord, while 35.6 percent replied that it is satisfactory. Joongang Ilbo, January 5, 2016. 11. , Joongang Ilbo, January 9, 2016. 12. Chosun Ilbo, January 11, 2016. 13. Yonhap News, April 7, 2016. 14. Yonhap News, December 29, 2015. 15. At the East Asia Security Forum co-organized by the East Asia Foundation and Nanjing University on April 8, 2016, all the Chinese participants, including former general Zhu Wenquan, raised deep concerns about the deployment of THAAD.